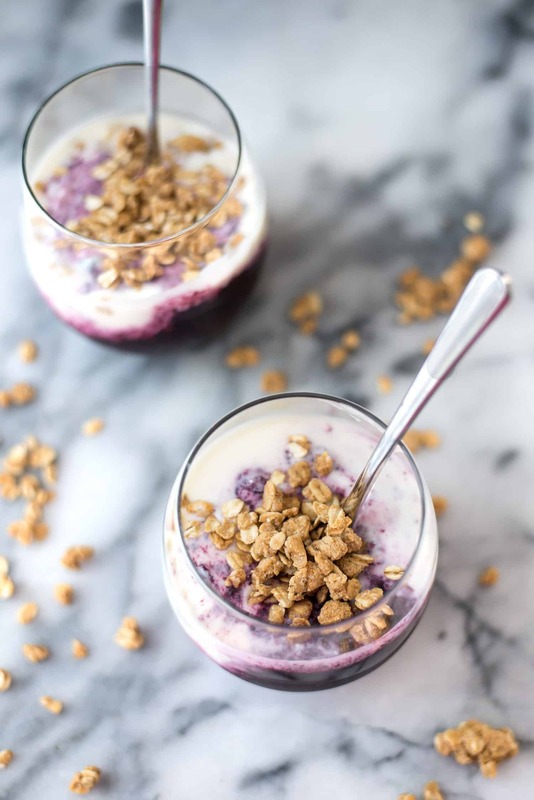 Wild Blueberry Chia Parfaits with Peanut Butter Granola! Such a yummy breakfast with make-ahead option. 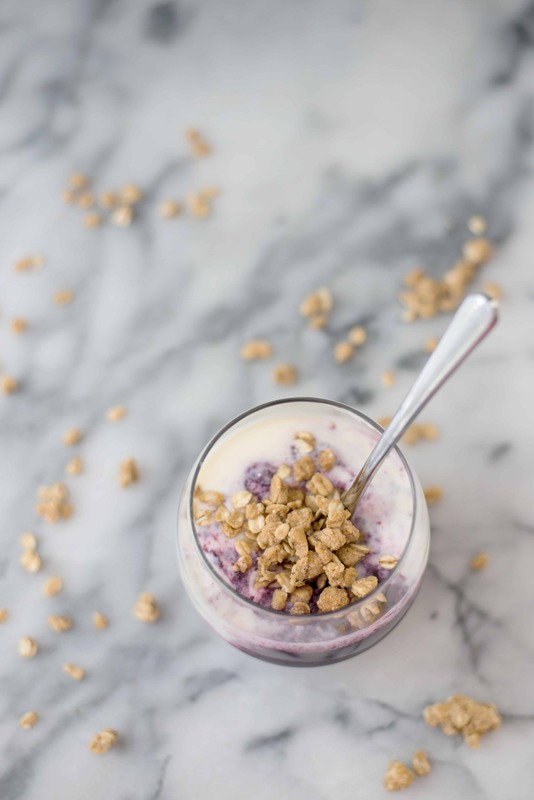 Layers of wild blueberry chia jam, yogurt and giant peanut butter cluster granola. After spending the past few days wrapped up in quality family time, the power of vacation is front and center of my mind. While my business may not like it, I relish time spent away from electronic devices, to-do lists and the anxiety that surrounds day-to-day life. So, I turned off this weekend. Ignoring phone calls, Instagram, texts and emails. Such a silly pleasure, but something I so rarely get to do. When you are away from the constant barrage of noises and reminders, you realize that you really don’t need them the way you think you do. A kind (and humbling) reminder that you’re not as important as you think you are: life goes on, things get done, and it will all work out in the end. Summer, you’ve been so good to me! Before my family drove out for a long weekend, I spent the previous few days in the incredible town of Bar Harbor, Maine. Oh my goodness, can we stay here? How did I not know this place existed? I’m a full Northeast convert, ready to tackle the hidden gems of Maine, Vermont and Rhode Island sometime in the very near future. Since landing in St. Louis, I think I’ve eaten more wild blueberries in the past week then I had in the previous year combined. 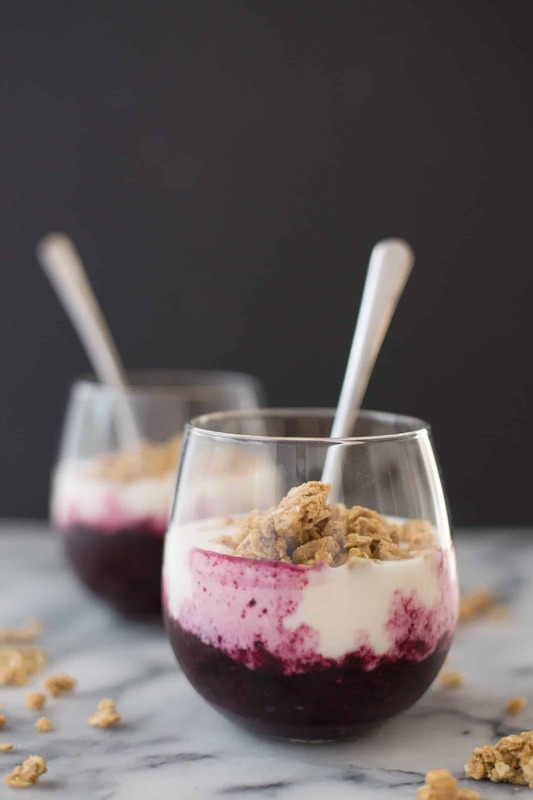 With my family here, I turned them into wild blueberry super fans, whipping up smoothies, salad dressings and these breakfast parfaits every chance I could. Sure, I knew that Wild Blueberries were good for you, but I never realized how good. With 2x the antioxidants (and flavor, btw) of regular blueberries, wild ones are the cream of the crop, literally. Wild Blueberries are exactly that- wild! They naturally grow where other fruits cannot, through harsh winters, terrible soil conditions and drought. Besides crowning wild blueberries as survivor all-stars, these conditions naturally reduce crop insects and pests. That means that even non-organic wild blueberries are sprayed with ~80% less pesticides than conventional blueberries. Nice, right? What’s left is a hearty, nutrient-rich berry that’s packed with so many health benefits (Alzheimer’s, improved insulin sensitivity, cardiovascular disease, just to name a few) that we all need to be eating more wild blueberries. If it can thrive in those crazy conditions, you can imagine how healthy it is for our bodies. This wild blueberry parfait is one of my favorite uses for frozen wild blueberries. Unless you are lucky enough to live in Maine during the growing season, you’re best bet for wild blueberries is in the frozen section. I’ve talked about this many times, but it’s worth noting again- frozen is just as, if not more, healthy as fresh. I was lucky enough to visit the Wyman’s plant during my time in Maine, and I can attest that those berries are picked and frozen in the same day. So fresh and just as nutrient-rich. I prefer buying mine in bulk at Costco ($10 for a huge bag! ), but Trader Joe’s and most other grocery stores sell them in the frozen fruit section. This parfait starts with a generous layer of homemade wild berry chia pudding. Frozen then thawed berries are broken up in a blender and combined with chia seeds and a touch of maple syrup. Place it in the fridge and it will gel in hours. Use it in these parfaits, then enjoy any extras in a AB&WB sandwich; wild blueberry chia jam and almond butter. For a more satiating breakfast, I add in a serving of yogurt on-top. (Siggis and Maple Hill Creamery are my go-to dairy options, So Delicious coconut yogurt is super yummy for vegans.) Juicy, berry-filled chia pudding is the perfect pairing for creamy yogurt. It’s like fruit on the bottom, but with more flavor and less sugar. To finish things off, let’s make some peanut butter granola! I wanted to create a breakfast option that would appeal to the entire family: peanut butter and jelly for the kids, fruit parfaits for the adults. This one checks all the boxes. These peanut butter granola clusters are so addictive, I can’t keep a batch in the house for more than a few days at a time. BL puts them on everything: cereal, ice cream and of course, these chia parfaits. Place the wild blueberries and water in a high-powered blender and pulse a few times until broken up. I prefer my jam to have bits of berries in it, but you can pulse the berries until almost pureed if preferred. Place together the broken up berries, chia seeds and maple syrup together in a jar. Cover and shake until well-combined (can also whisk together in a bowl). Place in the fridge at least 6 hours or overnight to set. Mix together the oats, peanuts, flour, baking powder and salt together in a large bowl. In a separate bowl, whisk together the peanut butter, maple syrup, milk, vanilla extract, cinnamon and nutmeg. Pour the peanut butter mixture into the oat mixture and stir until just combined. 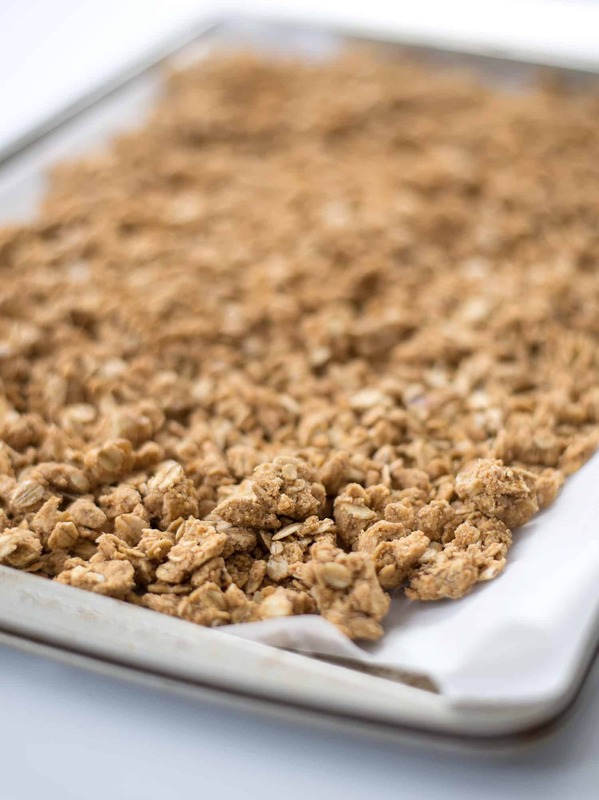 Pour granola mixture on a baking sheet and spread evenly. Bake for 15 minutes, stir, pat down and bake another 10-15 minutes until golden brown. Remove baking sheet from pan and let cool completely. Cooling is what allows the granola to form clumps. To assemble the parfaits: layer the chia jam and yogurt into jars. 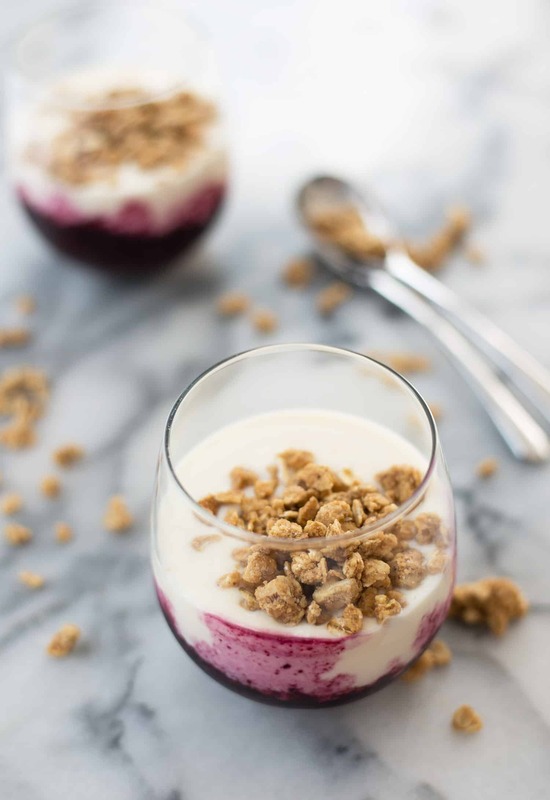 Spoon on granola and serve immediately. If making to enjoy for later, layer the jam and yogurt into jars and cover. Add granola right before serving. Beautiful photos and great breakfast recipe! Or even a snack between work and dinner.. 😉 Pinning it <3 !! These look amazing! I LOVE wild blueberries so much! And the addition of peanut butter is great! Yum! These looks and sounds amazing! omg that parfait looks amazing! Peanut butter granola? Yes please! Love a grown up PB&J! And isn’t bar harbor amazing? I didn’t know it existed either until I was on the Wild Blueberry tour last summer! Amazing! I can’t wait to go back there. I never knew how gorgeous Maine is, definitely planning a vacation there again soon! 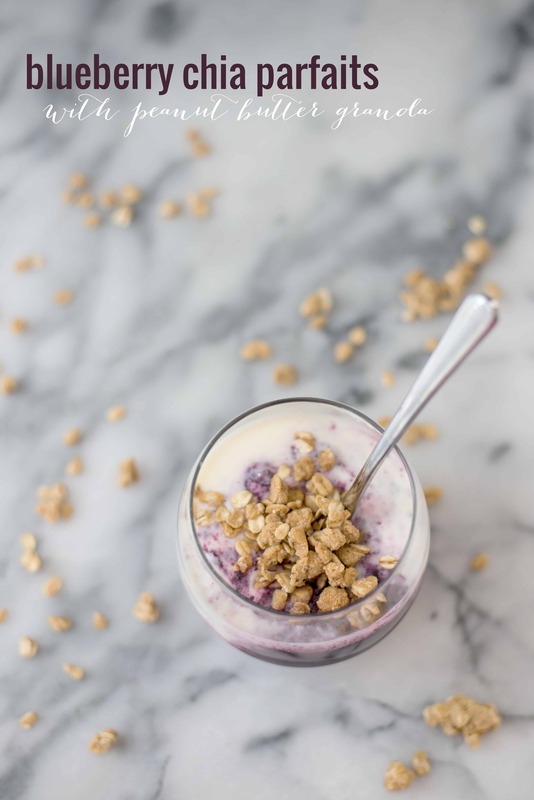 This looks so amazing…I think I need a book just for all your different granolas, parfaits, smoothie bowls, etc. !